“Why not join us on Saturday 9th December 10 pm at St James Church in Poole Old Town. 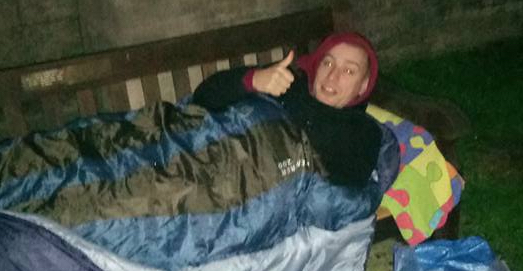 Spend a night sleeping outside in solidarity with our friends who are homeless: raising awareness and also vital funds for Routes to Roots’ Winter appeal. Last year we raised £1,055 and we are looking for new fundraisers to take on the challenge on this cold December night, and hopefully will beat that amount! “It will provide a small insight into what it might be like to be without a safe place to call home, and having to rely on the support of others. “You will need to bring a warm sleeping bag and lots of layers. We suggest bringing a ground sheet or some cardboard to sleep on, and some waterproof sheeting or a survival bag. If you have any questions about the sleep out or would like to join in, please contact Rev. Chris Harwood on 0781 3782 801.